Barrett’s oesophagus is a premalignant condition that predisposes to the development of oesophageal adenocarcinoma. It is detected on endoscopy and confirmed histologically by the presence in the lower oesophagus of a metaplastic mucosa, the so-called specialised epithelium, which resembles incomplete intestinal metaplasia in the stomach. These similarities with incomplete intestinal metaplasia are present on histology, mucin histochemistry, and immunohistochemistry with various differentiation markers (cytokeratins and MUC antigens). On morphology, the carcinogenetic process of Barrett’s mucosa progresses through increasing grades of epithelial dysplasia. Dysplasia, a synonym of intraepithelial neoplasia, is the only marker that can be used at the present time to delineate a population of patients at high risk of cancer. Among the numerous molecular events that have been shown to play a role in the neoplastic transformation of Barrett’s mucosa, only changes in DNA ploidy, increased proliferation, and alterations of the p53 gene have been suggested to be of potential help in the surveillance of patients. Glandular mucosa in the lower oesophagus presents as a red velvety mucosa over the gastro-oesophageal junction. It can extend either circumferentially or as one or several tongues, and in some cases as a mixture of these two patterns. Until recently, it was considered that this mucosa had to extend at least 30 mm over the gastro-oesophageal junction to diagnose Barrett’s oesophagus. But this definition has changed, owing to the recognition of short segment Barrett’s oesophagus measuring less than 30 mm.9,10 However, as it may be difficult to measure precisely a short segment Barrett’s oesophagus and to localise the metaplastic mucosa and the gastro-oesophageal junction, it is now well admitted that the major diagnostic criteria of Barrett’s oesophagus is histological. The significance of intestinal metaplasia discovered on biopsies taken from an endoscopically normal junction (sometimes considered as an “ultrashort” Barrett’s oesophagus) remains controversial, and will not be discussed in this text. Barrett’s mucosa with incomplete intestinal metaplasia (specialised mucosa). The epithelium is composed of goblet cells interspersed between intermediate mucous cells, both in the surface and glandular epithelium (haematoxylin–eosin, original magnification ×400). 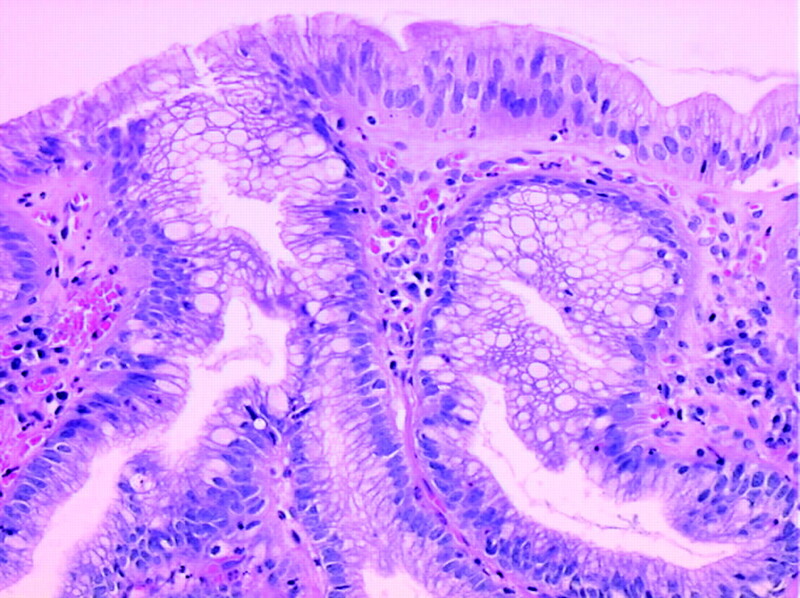 As immunohistochemistry is now routinely used in almost all pathology departments, numerous studies have tried to find sensitive and specific markers of intestinal type mucosa in the oesophagus. These markers include the MUC antigens and other mucin components, and different cytokeratin (CK) subtypes. Dysplasia is a purely morphological term. Although it could be considered from an etymological point of view as an ambiguous and vague term, meaning malformation, it is used by gastrointestinal pathologists to design premalignant lesions. Dysplasia has been defined by Riddell et al31 as an unequivocal neoplastic epithelium strictly confined within the basement membrane of the gland from which it arises. Although this definition was initially proposed for premalignant changes developed on inflammatory bowel disease, it has been progressively extended to the entire gastrointestinal tract, including Barrett’s oesophagus.32 Dysplasia as a premalignant lesion is strictly synonymous to intraepithelial neoplasia, a term in use in most organs including the gynaecological tract, and that has been recommended in Barrett’s oesophagus by the World Health Organization33 and by two recent consensus reports.34,35 Dysplasia has to be distinguished on both ends of the morphological spectrum of changes, from regenerative non-neoplastic modifications, often called atypia, and from invasive cancer, especially in its early or superficial form with an invasion limited to the lamina propria. Based on the degree of the abnormalities present, dysplasia is classified into grades of increasing severity. Although a three tiered classification (mild–moderate–severe) is still in use in some centres, most pathologists use a two tiered system that distinguishes between low grade dysplasia (LGD) and high grade dysplasia (HGD) (fig 2). In this two grade system, LGD includes the mild and moderate categories of the three grades system. The Riddell’s classification of dysplasia also includes a category of mucosa indefinite for dysplasia.31 The term carcinoma in situ (or intraepithelial carcinoma) is not used in the Riddell’s classification, as it is considered indistinguishable from HGD. In intramucosal carcinoma, neoplastic cells have penetrated through the basement membrane and infiltrate into the lamina propria, leading to a small risk of regional lymph node metastasis. The main morphological criteria for the diagnosis of dysplasia are presented in table 1. Dysplasia in Barrett’s mucosa, with both architectural and cytological abnormalities of low grade (A) and high grade (B) (haematoxylin–eosin, original magnification ×400). It has been shown for a long time that there is intra and inter-observer variation in the diagnosis of dysplasia in Barrett’s oesophagus. Given the progressive and subtle changes that occur from non-dysplastic to LGD to HGD, it is not surprising that this variation exists. Among the various studies published in the literature,37–41 some series have enrolled expert senior pathologists, and others have implicated general pathologists. In a recently published “expert” study, the diagnoses made by 12 senior gastrointestinal pathologists on 125 biopsies were compared.37 When a four grade system was employed (non-dysplastic/indefinite and low grade/high grade/cancer), the kappa index was low (0.43). Kappa improved (0.66) when a simplified classification was used (non-dysplastic/indefinite and low grade/high grade and cancer). In a study involving 20 general pathologists in the USA, there was very large variation on diagnoses of non-dysplastic mucosa, LGD, and HGD.40 These results emphasise the need to obtain a second opinion on difficult cases, especially when a therapeutic decision has to be made. The diagnostic differences are even more considerable when diagnoses made by Western pathologists and those made by Japanese pathologists are compared. This point is crucial when analysing the Japanese literature on early neoplastic lesions of the gastrointestinal tract. As Barrett’s oesophagus is rare in Japan, this problem may be less important for this lesion as for gastric and intestinal dysplasia. Nevertheless, in a study of 21 oesophageal lesions examined at the World Congress of Gastroenterology in Vienna, almost all lesions were classified as carcinoma by pathologists with a Japanese viewpoint, and only 10–67% of the same lesions by those with a Western viewpoint.42 After reaching a consensus, this international panel of pathologists proposed a classification to minimise disagreement. This “Vienna classification” is presented in table 2. The main advantages of this five tier system may be to propose clear surveillance and therapeutic consequences for the various diagnostic categories. However, this classification still has to be tested prospectively in a large series of patients. The natural history of LGD is even less known. This could be at least partially due to the poor diagnostic reproducibility of this lesion. It was considered traditionally that LGD was a very slowly progressing lesion in most cases. In most series, there was even a high rate of apparent regression from LGD to non-dysplastic mucosa. This last phenomenon has several potential explanations: initial overdiagnosis of LGD, due to the difficulty in differentiating reactive from dysplastic changes; sampling variability; or real neoplastic regression. However, this general opinion about the benign course of LGD has been challenged by some recent studies. In a study based on multicentre pathological recruitment among 26 cases with a diagnosis of LGD, 4 patients (15%) developed HGD and 4 (15%) an adenocarcinoma, 2–65 months after the initial diagnosis of LGD.3 In another study, 7 patients (28%) developed HGD (5 patients) or an adenocarcinoma (2 patients) after a mean follow up of 26 months (range 2–43 months) after the diagnosis of LGD.52 Very interestingly, in this latter study all cases were reviewed blindly by 3 gastrointestinal pathologists. When all 3 pathologists agreed on the initial diagnosis of LGD, 4 of 5 patients progressed to a more severe lesion, when none of the 8 patients with no agreement for the initial diagnosis progressed. In addition and parallel to the morphological sequence of events leading from metaplasia to carcinoma in Barrett’s mucosa, chromosomal changes and accompanying genetic alterations occur, with ensuing abnormalities in gene expression and cell cycle regulation. Although the frequency and timing of these alterations are not as well established as in colorectal carcinogenesis, some authors have proposed a molecular cancer progression scheme of Barrett’s oesophagus.4,5,53,54 Some of these changes may be used as criteria for recognising Barrett’s oesophagus patients with a high risk for developing cancer. Table 3 summarises the main molecular events that have been shown to play a role in the neoplastic transformation of Barrett’s mucosa. Only those changes that have been suggested to be of potential help in the surveillance of patients will be presented more in detail, that is changes in DNA ploidy, increased proliferation, and alterations of p53 gene and protein. Cells that contain any other formulation of chromosomes than 2N (diploid) and 4N (tetraploid) are said to be aneuploid. These cells can be detected by flow cytometry, which shows in some tumours and dysplastic tissues DNA aneuploid clones. The technique is based on staining a suspension of single cells with quantitative fluorescent DNA dye, with a detection system that shows an amount of fluorescence proportional to the amount of DNA in each cell. Aneuploidy does not correlate with any single mutation of the genes listed in table 3, but reflects large DNA changes due to genomic instability. Over 90% of HGD and adenocarcinomas developed in Barrett’s oesophagus are DNA aneuploid, and there is a significant relation between the presence of DNA aneuploid population and the progression from non-dysplastic Barrett’s intestinal mucosa to dysplasia and adenocarcinoma. As flow cytometry is able to detect a subset of patients with unremarkable biopsies (non-dysplastic or indefinite for dysplasia) but who have DNA content abnormalities identical to those observed in HGD and carcinoma, it has been suggested that this technique may be useful in screening patients with Barrett’s oesophagus. This theoretical interest is maximal in patients with LGD, a lesion with an undetermined natural history. The Seattle group has shown in prospective studies that patients with DNA aneuploid cells or increased DNA tetraploid populations have an increased risk of developing HGD or carcinoma.56 In a more recent study, the same group showed that among patients with non-dysplastic, indefinite for dysplasia, or LGD mucosa, the risk of cancer was strongly related to the presence of DNA aneuploidy or increased 4N populations.57 However, although some studies have confirmed that DNA aneuploidy is a prognostic factor for malignant transformation in Barrett’s oesophagus,58 other groups have reported frequent discordance between histology and DNA ploidy,59 which may be due to technical issues. This could partially explain why this technique is still not widely diffused in clinical routine practice. Most genetic changes that occur during the carcinogenesis of Barrett’s oesophagus affect genes involved in the regulation of cell cycle (table 3), with an ensuing increased proliferation. Initially, this hyperproliferative state was demonstrated by studies with tritiated thymidine, and later with BrDU. These studies showed an increased S phase in Barrett’s metaplastic mucosa, especially when dysplasia was present. DNA flow cytometry also allows us to study the cell cycle, and a number of studies have shown that the number of cells into the S phase and into G2M phases (DNA tetraploid cells) was a predictor of dysplasia. During the past 15 years, numerous studies have used two markers of cell proliferation that can be evaluated by immunohistochemistry on routinely processed oesophageal biopsies (review in16); proliferating cell nuclear antigen (PCNA) and Ki67 (usually stained with the monoclonal antibody MIB1). PCNA is an indicator of cell cycle progression at the G1/S transition, and Ki67 is expressed in proliferating cells (G1, S, G2, and M phases). Numerous studies have shown an increased proportion of cells stained by both antibodies parallel to the progression of histological changes from metaplasia to increasing grades of dysplasia. Interestingly, the proliferative compartment stained by Ki67 increases in size and expands from the base of the crypts towards the surface epithelium.60 However, due to large overlaps of Ki67 stainings between groups defined along the severity of histological lesions, this marker is not really used in clinical routine practice. The mechanisms of increased proliferation in Barrett’s mucosa and the possibilities of therapeutic control are issues of great importance. Several studies have shown both ex vivo and in vitro that acid plays a major role in this increased proliferation.61,62 The impact of effective acid suppression on the development of dysplasia and cancer requires prospective information. These results suggest that the study of p53 expression by immunohistochemistry is of interest in the surveillance of patients with Barrett’s oesophagus, especially in those patients with a mucosa indefinite for dysplasia or with LGD. Sampliner RE. Practice guidelines on the diagnosis, surveillance and therapy of Barrett’s esophagus. Am J Gastroenterol1998;93:1028–31. Haggitt RC. Adenocarcinoma in Barrett’s esophagus: a new epidemic? Hum Pathol1992;23:475–76. Montgomery E , Goldblum JR, Greenson JK, et al. Dysplasia as a predictive marker for invasive carcinoma in Barrett esophagus: a follow-up study based on 138 cases from a diagnostic variability study. Hum Pathol2001;32:379–88. Jankowski JA, Wright NA, Meltzer SJ, et al. Molecular evolution of the metaplasia-dysplasia-adenocarcinoma sequence in the esophagus. Am J Pathol1999;154:965–73. Werner M , Mueleer J, Walch A, et al. The molecular pathology of Barrett’s esophagus. Histol Histopathol1999;14:553–59. Beilstein M , Silberg D. Cellular and molecular mechanisms responsible for progression of Barrett’s metaplasia to esophageal carcinoma. Gastroenterol Clin North Am2002;31:461–79. Rustgi AK. Biomarkers for malignancy in the columnar-lined esophagus. Gastroenterol Clin North Am1997;26:599–606. Flejou JF, Chatelain D. Contribution of new tools to the characterization of Barrett mucosa. Gastroenterol Clin Biol1999;23:B20–9. Spechler SJ, Goyal RK. The columnar-lined esophagus, intestinal metaplasia and Norman Barrett. Gastroenterology1996;110:614–21. Sharma P , Morales TG, Sampliner RE. Short segment Barrett’s esophagus – the need for standardization of the definition and endoscopic criteria. Am J Gastroenterol1998;93:1033–6. Paull A , Trier JS, Dalton MD, et al. The histologic spectrum of Barrett’s esophagus. N Engl J Med1976;295:476–80. Zwas F , Shields HM, Doos WG, et al. Scanning electron microscopy of Barrett’s epithelium and its correlation with light microscopy and mucin stains. Gastroenterology1986;90:1932–41. Hassall E . Columnar-lined esophagus in children. Gastroenterol Clin North Am1997;26:533–48. Oberg S , DeMeester TR, Peters JH, et al. The extent of Barrett’s esophagus depends on the status of the lower esophageal sphincter and the degree of esophageal acid exposure. J Thorac Cardiovasc Surg1999;117:572–80. Cameron AJ, Carpenter HA. Barrett’s esophagus, high-grade dysplasia, and early adenocarcinoma: a pathological study. Am J Gastroenterol1997;92:586–91. Chatelain D , Flejou JF. 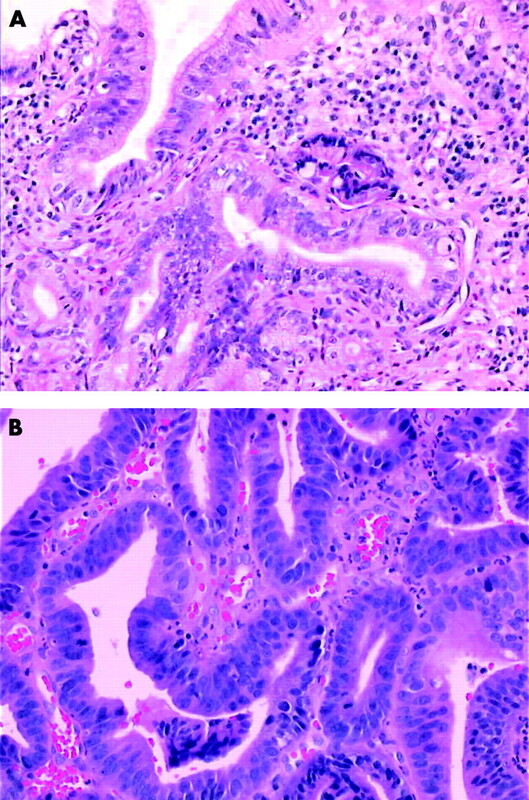 High-grade dysplasia and superficial adenocarcinoma in Barrett’s esophagus: histological mapping and expression of p53, p21 and Bcl-2 oncoproteins. Virchows Arch2003;442:18–24. Peuchmaur M , Potet F, Goldfain D. Mucin histochemistry of the columnar epithelium of the oesophagus (Barrett’s oesophagus): a prospective biopsy study. J Clin Pathol1984;37:607–10. Rothery GA, Patterson JE, Stoddard CJ, et al. Histological and histochemical changes in the columnar lined (Barrett’s) oesophagus. Gut1986;27:1062–68. Genta RM, Huberman RM, Graham DY. The gastric cardia in Helicobacter pylori infection. Hum Pathol1994;25:915–19. Chen YY, Wang HH, Antonioli DA, et al. Significance of acid-mucin-positive nongoblet columnar cells in the distal esophagus and gastroesophageal junction. Hum Pathol1999;30:1488–95. Ormsby AH, Goldblum JR, Rice TW, et al. Cytokeratin subsets can reliably distinguish Barrett’s esophagus from intestinal metaplasia of the stomach. Hum Pathol1999;30:288–94. Ormsby AH, Vaezi MF, Richter JE, et al. Cytokeratin immunoreactivity patterns in the diagnosis of short-segment Barrett’s esophagus. Gastroenterology2000;119:683–90. Couvelard A , Cauvin JM, Goldfain D, et al. Cytokeratin immunoreactivity of intestinal metaplasia at normal oesophagogastric junction indicates its aetiology. Gut2001;49:761–66. Glickman JN, Wang H, Das KM, et al. Phenotype of Barrett’s esophagus and intestinal metaplasia of the distal esophagus and gastroesophageal junction: an immunohistochemical study of cytokeratins 7 and 20, Das-1 and 45 MI. Am J Surg Pathol2001;25:87–94. El-Zimaity HM, Graham DY. Cytokeratin subsets for distinguishing Barrett’s esophagus from intestinal metaplasia in the cardia using endoscopic biopsy specimens. Am J Gastroenterol2001;96:1378–82. Mohammed IA, Streutker CJ, Riddell RH. Utilization of cytokeratins 7 and 20 does not differentiate between Barrett’s esophagus and gastric cardiac intestinal metaplasia. Mod Pathol2002;15:611–16. DeMeester SR, Wickramasinghe KS, Lord RV, et al. Cytokeratin and DAS-1 immunostaining reveal similarities among cardiac mucosa, CIM, and Barrett’s esophagus. Am J Gastroenterol2002;97:2514–23. Chinyama CN, Marshall RE, Owen WJ, et al. Expression of MUC1 and MUC2 mucin gene products in Barrett’s metaplasia, dysplasia and adenocarcinoma: an immunopathological study with clinical correlation. Histopathology1999;35:517–24. Guillem P , Billeret V, Buisine MP, et al. Mucin gene expression and cell differentiation in human normal, premalignant and malignant esophagus. Int J Cancer2000;88:856–61. Geboes K , Van Eyken P. The diagnosis of dysplasia and malignancy in Barrett’s osophagus. Histopathology2000;37:99–107. Riddell RH, Goldman H, Ransohoff DF, et al. Dysplasia in inflammatory bowel disease: standardized classification with provisional clinical applications. Hum Pathol1983;14:931–68. Schmidt HG, Riddell RH, Walther B, et al. Dysplasia in Barrett’s esophagus. J Cancer Res Clin Oncol1985;110:145–52. Werner M , Flejou JF, Hainaut P, et al. Adenocarcinoma of the oesophagus. In: Hamilton SR, Aaltonen LA, eds. Pathology and genetics of tumours of the digestive system. Lyon: IARC Press, 2000:20–6. Faller G , Borchard F, Ell C, et al. Histopathological diagnosis of Barrett’s mucosa and associated neoplasias: results of a consensus conference of the working group for gastroenterological pathology of the German Society for Pathology on 22 September 2001 in Erlangen. Virchows Arch2003;443:597–601. Offerhaus GJA, Correa P, van Eeden S, et al. Report of an Amsterdam working group on Barrett esophagus. Virchows Arch2003;443:601–7. Goldblum JR, Lauwers GY. Dysplasia arising in Barrett’s esophagus: diagnostic pitfalls and natural history. Semin Diagn Pathol2002;19:12–19. Montgomery E , Bronner MP, Goldblum JR, et al. Reproducibility of the diagnosis of dysplasia in Barrett esophagus: a reaffirmation. Hum Pathol2001;32:368–78. Reid BJ, Haggitt RC, Rubin CE, et al. Observer variation in the diagnosis of dysplasia in Barrett’s esophagus. Hum Pathol1988;19:166–78. Sagan C , Fléjou J - F, Diebold MD, et al. Reproductibilité des critères histologiques de dysplasie sur muqueuse de Barrett. Gastroenterol Clin Biol1994;18:D31–4. Alikhan M , Rex D, Khan A, et al. Variable pathologic interpretation of columnar lined esophagus by general pathologists in community practice. Gastrointest Endosc1999;50:23–26. Ormsby AH, Petras RE, Hendricks WH, et al. Interobserver variation in Barrett’s related high grade dysplasia and superficial carcinoma: can it be improved using uniform pathological criteria? Gut2002;51:671–6. Schlemper RJ, Riddell RH, Kato Y, et al. The Vienna classification of gastrointestinal epithelial neoplasia. Gut2000;47:251–5. Heitmiller RF, Redmond M, Hamilton SR. Barrett’s esophagus with high grade dysplasia. An indication for prophylactic esophagectomy. Ann Surg1996;224:66–71. Falk GW, Rice TW, Goldblum JR, et al. Jumbo biopsy forceps protocol still misses unsuspected cancer in Barrett’s esophagus with high-grade dysplasia. Gastrointest Endosc1999;49:170–6. Levine DS, Haggitt RC, Blount PL, et al. An endoscopic biopsy protocol can differentiate high-grade dysplasia from early adenocarcinoma in Barrett’s esophagus. Gastroenterology1993;105:40–50. Levine DS, Haggitt RC, Irvine S. Natural history of high-grade dysplasia in Barrett’s esophagus [abstract]. Gastroenterology1996;110:A550. Weston AP, Sharma P, Topalovski M, et al. Long-term follow-up of Barrett’s high-grade dysplasia. Am J Gastroenterol2000;95:1888–93. Dar MS, Goldblum JR, Rice TW, et al. Can extent of high grade dysplasia in Barrett’s oesophagus predict the presence of adenocarcinoma at oesophagectomy? Gut2003;52:486–9. Thurberg BL, Duray PH, Odze RD. Polypoid dysplasia in Barrett’s esophagus: a clinicopathologic, immunohistochemical, and molecular study of five cases. Hum Pathol1999;30:745–52. Skacel M , Petras R, Gramlich T, et al. The diagnosis of low-grade dysplasia in Barrett’s esophagus and its implications for disease progression. Am J Gastroenterol2000;95:3383–7. Morales CP, Souza RF, Spechler SJ. Hallmarks of cancer progression in Barrett’s oesophagus. Lancet2002;360:1587–9. Wijnhoven BP, Tilanus HW, Dinjens WN. Molecular biology of Barrett’s adenocarcinoma. Ann Surg2001;233:322–37. Hanahan D , Weinberg RA. The hallmarks of cancer. Cell2000;100:57–70. Reid BJ, Blount PL, Rubin CE, et al. Flow cytometric and histological progression to malignancy in Barrett’s esophagus: prospective endoscopic surveillance of a cohort. Gastroenterology1992;102:1212–19. Teodori L , Gohde W, Persiani M, et al. DNA/protein flow cytometry as a predictive marker of malignancy in dysplasia-free Barrett’s esophagus: thirteen-year follow-up study on a cohort of patients. Cytometry1998;34:257–63. Fennerty MB, Sampliner RE, Way D, et al. Discordance between flow cytometry abnormalities and dysplasia in Barrett’s esophagus. Gastroenterology1989;97:815–20. Hong MK, Laskin WB, Herman BE, et al. Expansion of the Ki-67 proliferative compartment correlates with degree of dysplasia in Barrett’s esophagus. Cancer1995;75:423–9. Fitzgerald RC, Omary MB, Triadafilopoulos G. Dynamic effects of acid on Barrett’s esophagus. J Clin Invest1996;98:2120–8. Peters FTM, Ganesh S, Kuipers EJ, et al. Effect of elimination of acid reflux on epithelial cell proliferative activity of Barrett esophagus. Scand J Gastroenterol2000;35:1238–44. Kim R , Clarke MR, Melhem MF, et al. Expression of p53, PCNA, and C-erbB-2 in Barrett’s metaplasia and adenocarcinoma. Dig Dis Sci1997;42:2453–62. Younes M , Ertan A, Lechago LV, et al. p53 protein accumulation is a specific marker of malignant potential in Barrett’s metaplasia. Dig Dis Sci1997;42:697–701. Weston AP, Banerjee SK, Sharma P, et al. p53 protein overexpression in low grade dysplasia (LGD) in Barrett’s esophagus: immunohistochemical marker predictive of progression. Am J Gastroenterol2001;96:1355–62. Selaru FM, Zou T, Xu Y, et al. Global gene expression profiling in Barrett’s esophagus and esophageal cancer: a comparative analysis using cDNA microarrays. Oncogene2002;21:475–8.